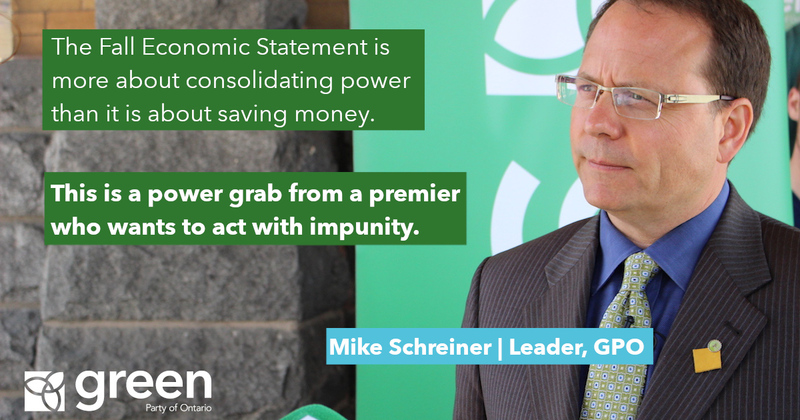 “Premier Ford’s attack on the checks and balances that hold government accountable are outrageous. It is bad for people and democracy. The Fall Economic Statement is more about consolidating power than it is about saving money. This is a power grab by a Premier that wants to act with impunity. Why does the Premier refuse to be held accountable by watchdogs responsible for protecting children and the environment? It’s appalling that the Premier would take an axe to Ontario’s Child Advocate and target vulnerable children across the province. The advocate’s work has led to essential reforms in our child welfare system and the safety of our children is the last thing we should be sacrificing to save money. It is galling that the Environmental Commissioner of Ontario would be eliminated just two days after a bombshell report about the rapid disappearance of wetlands and the release of raw sewage into Ontario’s lakes and rivers over 1,300 times last year. This is an attack on people’s environmental rights and an effort to shield the Premier’s anti-environment agenda from oversight. The PC government went even further by relinquishing our say over major fossil fuel projects coming across our borders. It makes no sense and represents nothing more than jumping onto a national conservative bandwagon to block action on the urgent climate crisis. The Premier dealt another blow to democracy by raising the threshold for official party status. This threshold puts Ontario way out of step with all other provinces and is nothing but a punishment to smaller parties.